These are very rarely called Pale Gray-Winged Sulphur Duns. This is the most commonly mentioned species of Centroptilum in angling books, but very little detail is ever given about its hatches. It has been reported to inhabit warm water, but information regarding cold water habitat is sketchy. 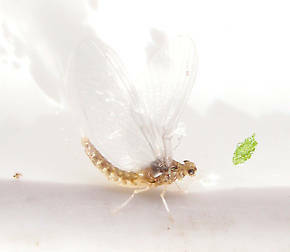 Female Anafroptilum album (Tiny Sulphur Dun) Mayfly Dun View 3 PicturesApprox. 5 mm. This is a very significant hatch. It is mostly seen at the height of Summer and I was very surprised to see it emerging this late in the season and in such numbers. When this one is emerging, the fish can become quite selective.